The Baltimore Catechism No. 3, 1885 is frequently used as a Post-Confirmation course and frequently requires a good deal of study time. 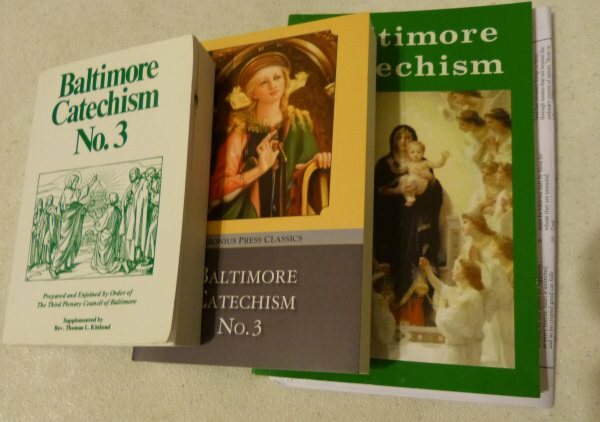 In general, the Baltimore Catechism is one of the most popular Catholic catechisms. This one is giant with 1400 questions and answers in Thirty Seven lessons. It is usually assigned to those who have already been Confirmed. The numbering of the questions is not the same as it is with the Nos. 0, 1, and 2. For example, The Our Father Prayer is one of the numbered items and has questions about it for the children to learn and memorize. In this book the prayers are part of the numbered items. The Nos. 1 & 2 have meditations for Mass and Confession as well as hymns. The No. 3 does not have the meditations and hymns. The original book is relatively small compared to the 1949 CCD version, which see below. Thomas Aquinas Nelson of TANBooks did the Catholic Church a huge favor when he republished the BC in 1974. Tradition minded Catholics have flocked to it ever since. It is shown as the green on white book in the photo above. It is simply a Xerographic version of the 1885 version. This means that it is like a photograph of the original. Catholics love this for certitude that the doctrine is as it had originally been taught. The No. 3 expands on the smaller catechisms in a way that is very useful to teens and adults, especially since it is concise. and four for No. 4. There are four books in the set. If you are buying the book for your own use, you will only need one book as the information accumulates where each successive book contains the information in the previous books. The Angelus Press and Baronius reprints are similar to TAN's 2007 reprint and seem to be faithful to the original 1880s version. The Baronius is pictured in the top photo on this page. Seton Press reprinted the 1949 Confraternity version of the Baltimore Catechism No. 3. This book has many of the changes that the Confraternity for Christian Doctrine (CCD) made in the 1940s. Q. 132. Who is God? God is the Supreme Being, infinitely perfect who made all things and keeps them in existence. Ahem. This removes the idea of Creation and the name of Heaven. The following explanations do not explain the truth that God created Heaven and earth and all things, nor do the Bible quotes which do not quote Genesis 1:1. If you read the extra information in Question 3, you will find more of the answer to Question 2. I find this an odd presentation, especially when the original was so well worded. For reasons like this I have not read most of this version of the Baltimore Catechism No. 3. I simply do not have time to wade through it. I also do not trust that I will be able to discern where the text may mislead me in matters of faith. This brings up the point that it is hard to compare the versions because the numbers to the Questions are different. The 1949 CCD removed the questions and answers from the prayer lessons that had been in the 1885. The prayers remain, yet the questions and answers are gone. (iv) CCD Questions and Answers On Q&A? A catechism is a question and answer book. Adding True/False questions, matching column selections, and story starters diverts a student from learning the actual answers to the original questions, not to mention that the original answers are not given in some instances. A wonderful mother a generation older than I pointed out to me that a danger with assignments like the CCD and its New Saint Joseph catechisms have, any "study helps" of this type, is that T/F, multiple guess, and fill-in-the-blank assignments, quizzes, or tests is, if the student gets the answer wrong and no one corrects the assignment and the student, the answer remains wrong in the student's mind. A teacher or parent must be diligent to correct the answers and to correct the student. So many times students look at a grade and say something to the effect of, "85% Too bad." as they put the paper in their desks or binders never to look at them again. How many of us were test-time heretics? The Confraternity version of the Bible had already changed the words to the first books of the Bible and the New Testament by 1949. These continued through 1960. These changes were never finished as this version was morphed into the New American Bible (NAB) which was used in the 1970 liturgy. An easy example of a Bible quote that was changed by the CCD and used in this catechism is Genesis 3:15 where "she shall" is rendered "he shall". St. Alphonsus Liguori makes note of this in The Glories of Mary. Another is the words to the Judica me, as found at the beginning of the Mass Lesson. It also used unisex language and more. Anyway, this is the paraphrased Bible that this CCD catechism uses. Not only do the answers have additional explanations, so do the lessons have additions as with the above mentioned study helps, Bible paraphrases, and "Important Truths About ... " sections. Do your due diligence here. In short the 1949 CCD version of the Baltimore Catechism #3 reminds me of the CCD New Saint Joseph Baltimore Catechisms produced by Catholic Book Publishing Company. You can read more here. If you want a more readable catechism on an adult level, meaning a book to enjoy as one enjoys a good story, you will like The Catechism of the Council of Trent (CCT) or The Catechism Explained. The BC No. 3 is excellent for being concise; yet as the CCD tried to supply from the 1940s through the 1960s, many adults want a more explanation and a conversational tone. Actually, the No. 3 was based on the CCT, yet does not include Bible stories and examples from the lives of saints. If you need to teach or to memorize doctrine you'll want to purchase the BC3. If you want reading material I really, really like The Catechism of the Council of Trent and The Catechism Explained. They are excellent for reference and you will see that I refer to them throughout this site. The Baltimore says that it is based on the Catechism of the Council of Trent so if you already have the CCT, you would not need to get the Baltimore Catechism No. 3, although the Q&A format of the BC#3 allows easier memorization and class work. We've used the CCT for high school, me reading it out loud with our children in eleventh and twelfth grade. We really learned a lot from reading it, as it caused the children to ask real life questions that we were able to "talk through". It's easier to read than I'd thought it would be, and it includes many Bible and saints stories. I am glad that our children know that they can read it and refer to it throughout their lives as well. It has the best historical prefatory notes on the planet. They explain the history of getting it published. See more about the Catechism of the Council of Trent here. The Catechism Explained is much more doctrinal, yet it tells many excellent Bible, saint, and example stories. I use it as a reference as it has a general catechism format, meaning that it is easy to find the Ten Commandments, the Sacraments, and the prayers. It also has an excellent index, which is rare for a book printed in its time. Read more of my thoughts about using it here. 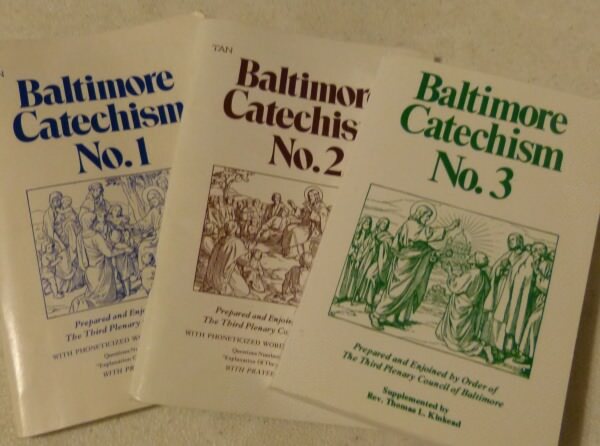 Baltimore Catechism Three - I would stick with the TAN, Angelus, or Baronius. The Catechism of the Council of Trent - My favorite! The Catechism Explained - Super informative. In the 1970s TAN Books republished the 1885 Baltimore Catechism No. 3.